Think; you just started your business and are in need of an industrial metal nameplate or decal. One that can with stand the harsh conditions your equipment goes through. You have a lot of questions but don’t know whom to turn to. The experts at U.S. Nameplate are here to answer those questions. The biggest question you have is probably: What is it going to cost me? Typically, 4/5 of the cost of an industrial decal or metal nameplate is labor, and 1/5 is the cost of material. Metal will cost more than other substrates such as polyester, polycarbonate, vinyl and paper. Even though you will pay more initially, you will get a longer lasting product. Which brings me to the next question. How long will my industrial decal or metal nameplate last? The length of durability varies greatly by exposure to the elements: temperature, humidity, how much sunlight it gets, for example. Generally, you can expect high performance premium vinyl films to last 5-7 years. Economy grade vinyl films, which are less durable, can last between 1 and 3 years. Vinyl is a durable plastic film that is flexible. Often, vinyl is used on curved surfaces and is abrasion resistant and water and weatherproof. Standard polycarbonate can be expected to last 3 years whereas coated polycarbonate can be expected to last 5-7 years. Polycarbonate is a strong, rigid plastic film offering excellent chemical and abrasion resistance. In addition, polycarbonate has good electrical qualities and like vinyl can conform to surface irregularities when heated. Polyester films can last around 2 years. Polyester is a very strong plastic film. It does not conform as well as polycarbonate or vinyl, but offers little or no shrinkage. Metals however, can almost stand the test of time depending on the process. Aluminum and stainless steel, which can be screen printed or digitally printed, can last 20 years. Aluminum that has been etched or screen filled can last around 25 years. Metalphoto decals and nameplates can last over 30 years. Aluminum is one of the most widely used metals in the world. Its lightweight, high strength excellent chemical resistance and temperature resistance makes aluminum a high performance label application. Aluminum can also be anodized which creates an even more durable aluminum product. Stainless steel’s resistance to corrosion, staining, temperature, low maintenance and familiar luster make it an ideal material for many label applications. All these numbers are if conditions are perfect. With simple cleaning and maintenance every once in a while, your industrial decals and metal nameplates can last even longer. The process of how your industrial decals or metal nameplates are printed depends on how long you would like for them to last. U.S. Nameplate has the capabilities to Metalphoto, metal etch, screen print and digitally print your industrial decals and metal nameplates. 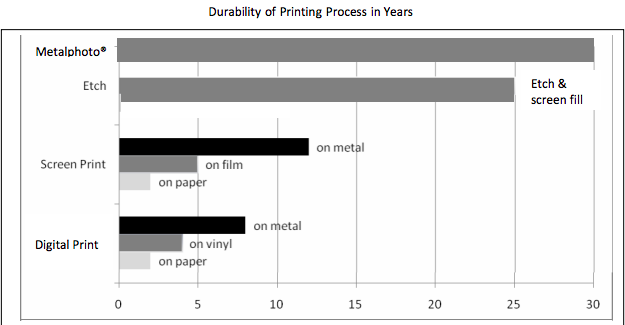 The table below shows the durability of the printing process in years. These are just a few questions you may have. Contact us or call us at 1 (800) 553-8871 and a U.S. Nameplate representatives will be pleased to answer any other questions you may have. U.S. Nameplate Co. has been the supplier of choice to over 3,000 OEM’s and is equipped to handle any size of orders from one to millions.